Are you all still following along with the Jaftex blog hop? There is just one more day left, so if you haven’t signed up for a chance to win the prizes, you better hop to it! Here is the link to the prizes, and a link to the list of blog hoppers. Today I want to share a little bit more about my boy’s birthday quilts. Years ago my Mom met someone at a quilting retreat that made birthday quilts for their grandkids. 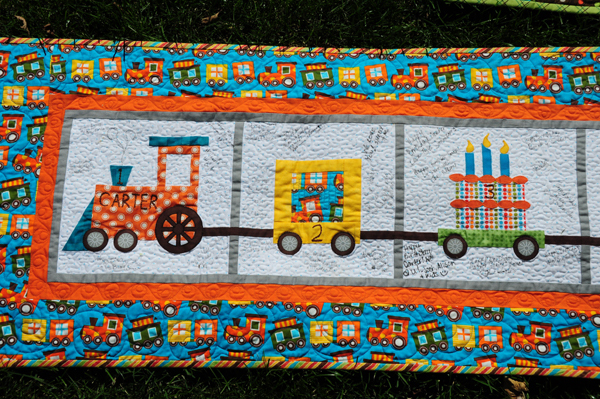 Each quilt had numbered blocks and at the corresponding year’s birthday party, everyone at the party signed the quilt. It’s a great idea and a great keepsake for the kids. My Mom has started that tradition in our family and we have been the lucky recipients of two of her quilts. Out of all the quilts in my house (and that is a lot), these are my two favorite quilts. In addition to the sentimental reasons, the themes and colors are just so much fun. 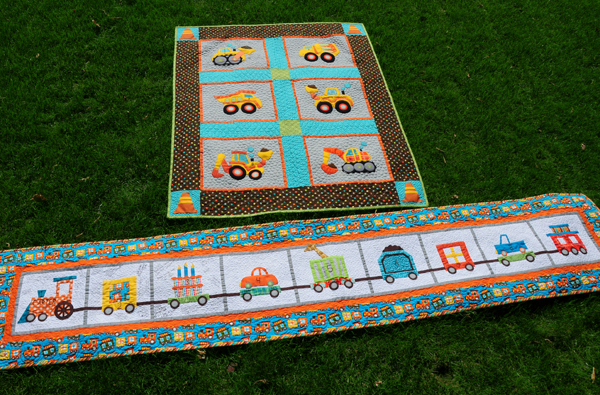 The train quilt is Carter’s and the construction quilt is Maxwell’s. 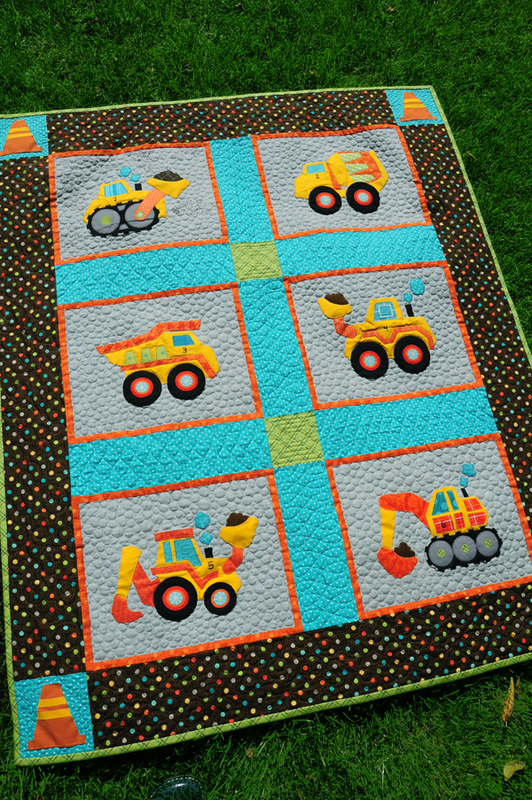 My boys love trucks and diggers, so when my Mom mentioned that theme for Max, I told her I happened to have a pattern that would work. I’ve had it in my stash for years and I have no idea how I ended up with it. I was still able to find the pattern online here. Below you can see the signatures and notes from Max’s first birthday party. 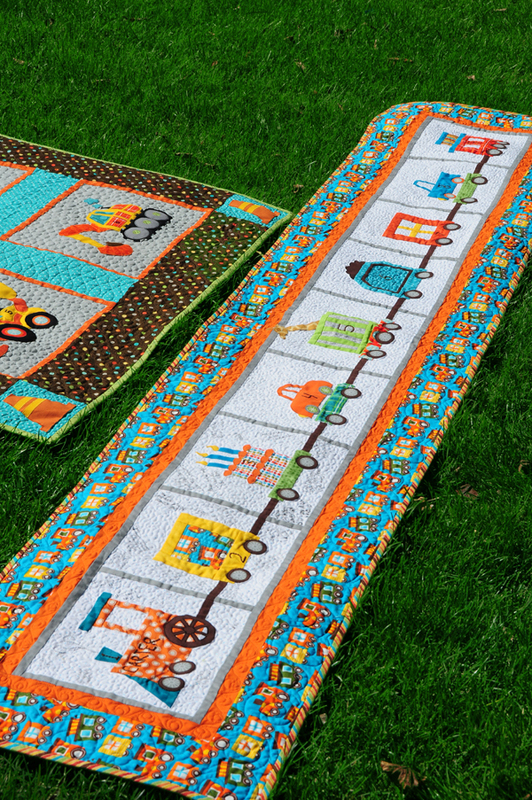 The trucks are all machine appliqued using a small zigzag and matching color thread. I quilted the background to look like rocks or pebbles. I love that little construction cone in the corner. Carter’s train quilt has been to 3 parties, as you can see. This quilt combines piecing and applique. It’s an original design of my Mom’s, so that also makes it special. As you know, I kinda get into things like that. Is it just me, or aren’t they the cutest? Too cute to just put away right after the party, so they stay out a while longer. I do the same thing with my Christmas quilts. If you are interested in this idea, Mom and I published a pattern several years ago called “The Birthday Collection” that was designed for this purpose. Click here to see the pattern. Thanks for stopping by – I’ll be back shortly with a preview of my newest patterns. 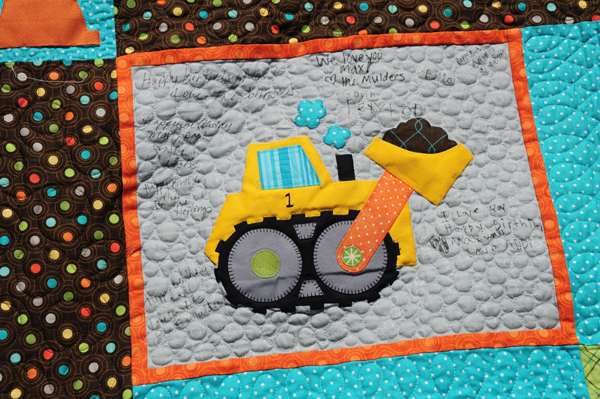 This entry was posted in Family, Quilting and tagged birthday party quilts, boy quilts. Bookmark the permalink. They are too cute……I have two grandson’s that would love them too!!! Love all of Heather’s quilts. I have made several and they turn out so cute and are some of my favorite! 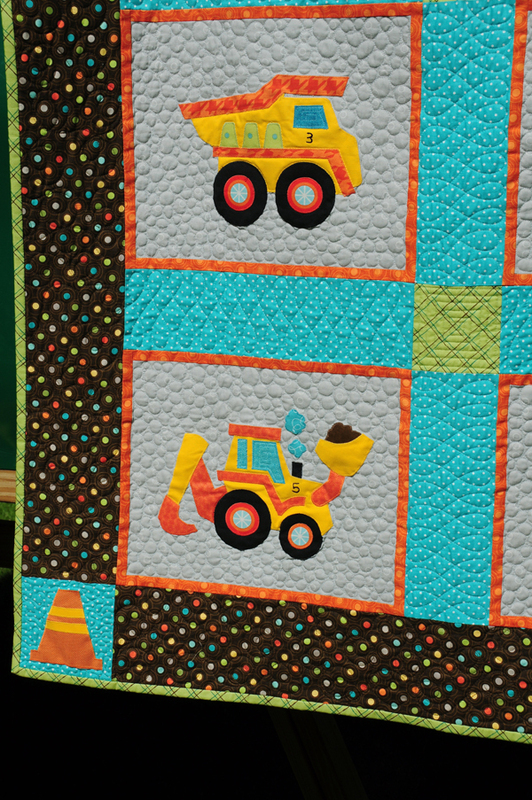 Just ordered the pattern for the big trucks and equipment and some of Heather’s fabric!